Bill Jenkinson, a resident of the Philadelphia area, is a baseball historian and has been a researcher for the Baseball Hall of Fame. Bill has spent the past 25 years conducting in-depth research on the Babe and the history of his homeruns. 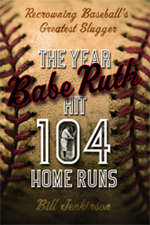 The culmination of those efforts is the upcoming book, “The Year Babe Ruth Hit 104 Home Runs: Recrowning Baseball’s Greatest Slugger.” Bill’s book, which is due out in March 2007, takes a new and unique look into the Babe and his hitting abilities. Here’s a description of his book from Amazon: “In an unprecedented look at Babe Ruth’s amazing batting power, sure to inspire debate among baseball fans of every stripe, one of the country’s most respected and trusted baseball historians reveals the amazing conclusions of more than twenty years of research. Jenkinson takes readers through Ruth’s 1921 season, in which his pattern of battled balls would have accounted for more than 100 home runs in today’s ballparks and under today’s rules. Yet, 1921 is just tip of the iceberg, for Jenkinson’s research reveals that during an era of mammoth field dimensions Ruth hit more 450-plus-feet shots than anybody in history, and the conclusions one can draw are mind boggling.” We at BRC had the privilege of interviewing Bill for the site and getting the opportunity to learn more about his unique knowledge regarding the Babe and his homeruns. Bill talks about his reasons for writing a book on the Babe. Bill talks about the source of his initial interest in Babe. Bill talks about Babe’s growth as a person. Bill discusses Babe’s importance to baseball today. Bill talks about some of the public misconceptions of the Babe. Bill talks about Babe’s love of children.